Republic of Gamers teamed up with Activision to create a desktop PC for Call of Duty super-fans. This PC-powerhouse comes equipped with the latest hardware and some extras, but its price might be out of reach for many. 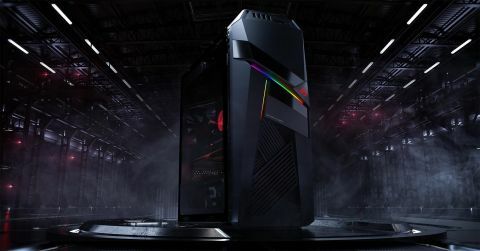 The ROG Strix GL12CX is one of the few desktop gaming PCs currently on the market that combines the dynamism of the RTX 2080 and the Intel i9-9900K, both of which we know plenty about individually. What’s special about this power-couple is that the CPU comes factory-overclocked to up to 4.9GHz full octa-core—and it’s all packed under an all-in-one, liquid-cooled system that is so silent you’ll forget it’s on. The hardware package alone seems like a good investment if you’re the kind of person who has to have all the latest tech, but don’t commit to spending your future holiday bonus just yet. Let’s talk specifics. Turned off, the solid black chassis captures the silent ninja look Asus was going for. The sharp edges and bold angles aggressively stare you down, challenging you to a duel. Turned on, small strips color glow from between the cracks, like a diamond emerging from a lump of coal in the daylight—the effect is beautifully subtle. The compact design is the same as the original GL12CM. Size: 7.0 x 15.7" x 18.0"
This special Black Ops 4 edition also comes with a clear side panel for those who prefer a more intense diamond-in-the-rough aesthetic—and a clear view of all the hardware. Aura Sync lighting adds a specific color pattern to your keyboard as soon as you start Black Ops 4. It slowly pulsates a muted orange timed with with specific drum beats in the opening music, and then changes the color on specific keys for movement, inventory, and other essential keybindings once you’re in-game. It’s a nice feature, but ultimately one that didn’t matter once I was playing the game, since my focus was on keeping myself and my teammates alive. One of the more wonkier features is the magnetized front panel. It provides easy access to the optical drive and hot-swappable SSD tray, but the panel doesn’t attach to the case any other way, like with a hinge or something similar. The whole thing pops off, which isn’t a huge deal. It just means you have to set it aside, but if you like organized chaos on your desk, you might lose it under stacks paper or other clutter. But that’s all extra. How does it perform? Like you’d expect—great. At 1080p and the highest graphical settings possible, the RTX 2080 handles some of the most demanding games with ease. Whether I was struggling to survive against an onslaught of zombies or navigating my way through a large, busy crowd during a Día de Muertos festival in Mexico, not once did my screen stutter or suffer any kind of framerate dip. The in-game benchmarks showed Shadow of the Tomb Raider and Total War: Warhammer II both averaged consistently between 90 and 100 fps. Tom Clancy's Ghost Recon: Wildlands came in at an average of 65 fps, much lower but still in an ideal range. It pushed the GPU to its limits, though, as it ran between 92% and 97% capacity at any given point, which brings me to some of the other benchmarks I performed in 3D Mark. Unfortunately, I don’t have either a 1440p or 4K monitor at my disposal to run our gaming benchmarks at higher resolutions, but I did test the GPU in Fire Strike Extreme and Ultra, the 1440p and 4K variants of 3D Mark's gaming benchmark. In those tests, the RTX 2080 scored a 11683 for Extreme (1440p) and 6159 Ultra (4K), respectively, which is about in-line—perhaps slightly lower—than you should expect from Nvidia's new GPU. A small, but important issue I ran into—I could not get Shadow of the Tomb Raider to run with DirectX 12, even after checking for all the usual things like updated drivers. This could be isolated to the computer I was using, or maybe it’s something a little more widespread, but it's an easy fix—just uncheck the box in the game settings. Considering that the RTX 2080 is designed to support DirectX 12, it should be worth noting that there are some kinks that need to be worked out. The i9-9900K provides great support to the RTX 2080. Looking at the single core benchmarks in Cinebench, this CPU comes in at an average of 212 cb (keep in mind that it’s overclocked), which is higher than the top CPU on their list. However, the multi-core test only brought the i9-9900K in at an average of 2090 cb, which is lower than the i9-7900X. Obviously, take this with a grain of salt; 3D Mark’s benchmarks for Ghost Recon: Wildlands’ put the CPU usage at about 20% on the low end and 52% on the high end, so the i9-9900K can handle way more in terms of gaming. Both the CPU and GPU performance, among other settings, can be controlled with Armoury Crate. Still interested? The GL12CX has an MSRP of $3,799. If you look at the current retail price of each piece of hardware individually, the i9-9900K is priced at $579.99, and the RTX 2080 is $849.99, which is half of the total cost of this desktop PC. An SSD will cost you between $100-$200, 32GB DDR4 (2x16) RAM about $250-$400, a new motherboard about $250-$350, a liquid cooler $100-$200, a mid-tower case around $100, and a power supply around $100. If you add those numbers up, there's roughly $500 to $1,000 to be saved by building an equivalent system yourself, but that's without factoring in the cost of prebuilt benefits like warranty, labor, and in this case, the special Call of Duty-edition extras. Speaking of, the special CoD edition doesn’t offer much besides a free copy of the game (the standard edition, no less) and a bunch of stickers for you to apply at your leisure. It's also questionable if a keyboard and mouse is included with this special edition GL12CX. The Asus store lists these peripherals as add-ons, but other retailers like Newegg say one version of this desktop comes with a keyboard and mouse, while Amazon says they are sold separately. The peripherals don't have any special CoD spin on them, either, but if you're in need of a new mouse and keyboard, it's a nice addition. Either way, it's hard to say what this version will come with considering the Asus website doesn't list it for preorder yet. If you don't like the idea of building your own rig, but you also don't like the price of the GL12CX, there's a cheaper version with a factory overclocked i7-9700K, RTX 2080, and 16GB RAM for $2,599.99. The hardware in the GL12CX is, unquestionably, nice, but overpriced like most prebuilts, especially if you don't care about the CoD extras. If you're in the market for a quiet and powerful prebuilt, it might be worth considering when the time comes—just don’t make the stickers and free game your deciding factor.